i am tres giddy because that means a brand new shiny week is waiting to happen in just a day or so. i am gearing up for said shiny week by cleaning our shed and shuffling things around. i can not clean a shed without shuffling, it makes the cleaning so much more thrilling when you plot and plan the movement of furniture and knick knacks. in the meantime, how about a little recap of last friday's book launch. ("hello hello", said whilst waving to you). new friends and old friends came out to support the book and Janine and myself were tres delighted. the peachy Andie and Emily of Assemble Shop are the bees knees without a doubt. Janine put together a little video of the evening, 'cause she is pretty spiffy that way. dottie angel book launch from UPPERCASE gallery on Vimeo. Your things are so fun and whimsical. they put me in a good mood just looking at them. How I wish we had fun shops and galleries. Your book launch looked such fun! So happy for your success. Looks to be a jolly book launch! It must be Autumn cleaning week! I'm doing the same. 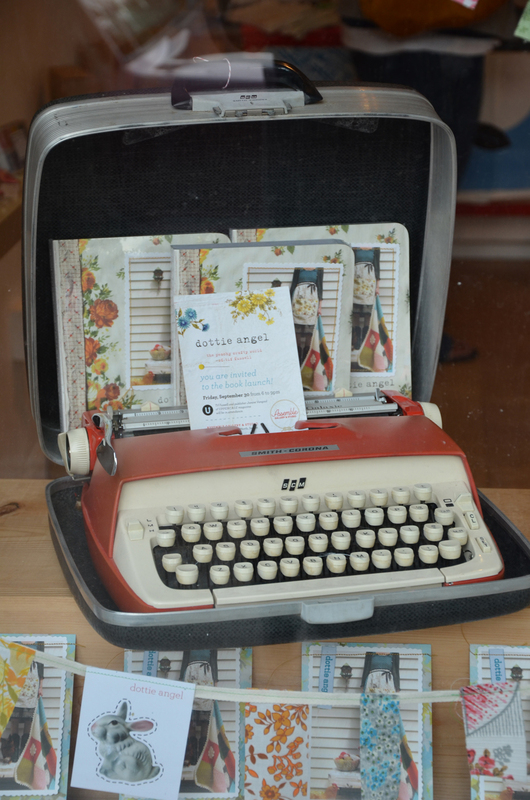 Love that typewriter. I have a big old Imperial one in the loft, just about breaks my fingers trying to work the keys! The book launch sounded wonderful, so glad all those bees and their knees came to support you. Have a great weekend, we are allowed to put our brooms away for a couple of days. I wish I could have been there. I had the same typewriter (except it was all blue) until just a few years ago. You are just as cute as your cute book. So pleased that everything went so well, I think you are the cat's pyjammas! have a peachy weekend my dears! I bought your book in your Etsy shop and I love it..You are such an inspiration!! 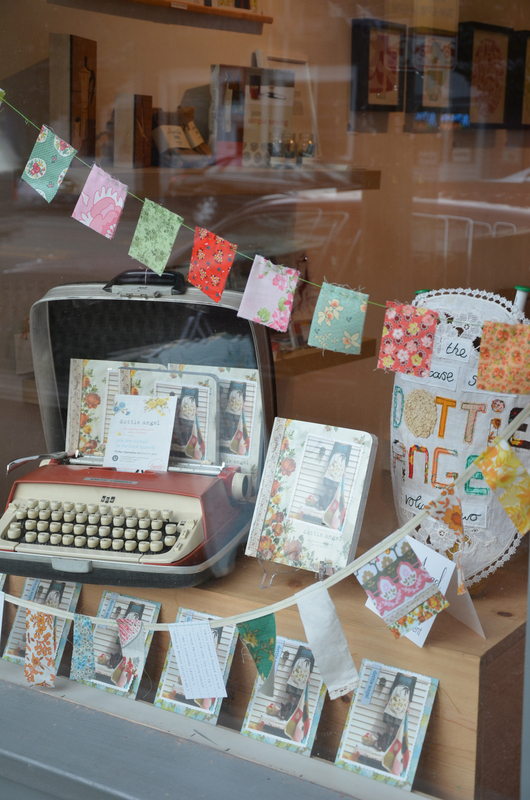 I absolutely love the shop window displaying your books....how very Dottie....especially the Dottie Bunting...most excellent. many thanks dearest lovely folks. have a spiffy weekend!! Wish I was there! Will you be coming to L.A. any time soon? Keep making, writing, doing what you do. Having seen your video, my hair is getting revamped next pay day. Gush gush. Tah-rah Dottie, you inspiring girl you! Oh Tif how WONDERFUL....I LOVED the clip....You looked POSITIVELY radiant....!!!!! c'est génial! !j'ai acheté votre livre ..plein d'idées et de chame!! j'adore !!bravo!!! Kathleen, hurrah for sugar cookies and your crafty creative family, warms me up on the dreary cold morning, thank you! Tiff, you are the tiffiest! I can't wait for your book to arrive at my front door!!! Oh my, I must have my head buried in the mountains of laundry that have piled up 'round here as I've only just seen this. I was so very pleased to have been lucky enough to attend. You are a wonder my dear, and the most gorgeous crafty soul. I think that that bees knees business is going to my head. So excited for you! I love that pup of yours too! i wandered into the shop and saw your lovely lovely display!! i just adore your lamp shades--so so pretty! !